Hawaii is a dream destination with its white sand beaches and clear blue water, but it can also be stressful planning a trip to paradise. One of the hardest things to decide is which islands to go to. For those who are visiting for the first time it can feel especially overwhelming. Each island has it own characteristics, climates, and natural landscapes, and it’s important to know if the island fits your personal needs. Here’s a Hawaii itinerary that will allow you to experience two different islands, the first one a bustling city, and the second a quieter island getaway. For Waikiki Beach, there are plenty of options for being car-free, like ride share companies and local buses. For day trips, it’s more convenient to rent a car, especially for places that are an hour or more away like the North Shore. Start your trip out on the bustling Waikiki Beach, where you can wander along the famed stretch of sand amid sunbathers and surfers. If you’re in the area on Tuesday or Thursday from 4-8pm, drop by the Hyatt’s Farmers Market, where you shop for local produce and delicious homemade food on the ground floor. Drive to Diamond Head for a sunset hike, where it takes about 25 minutes to get to the top for stunning views of Waikiki Beach and the Pacific Ocean. Take an Uber to avoid parking fees/congestion ($5 parking or a $1 walk-in fee). Back in Waikiki Beach, head to Marukame Udon and brave the line for the freshest udon made right before your eyes. For dessert, try Henry’s Place, which is a tiny family-run ice cream shop with local flavors like ube and kona coffee. Spend the day at this historical site where you will learn about the significance it played for the U.S. in World War II. There are a lot of monuments to see including the USS Arizona Memorial, USS Bowfin, and the Pacific Aviation Museum. Pearl Harbor is about a half an hour drive from Waikiki Beach, and be prepared to spend most of your day there. If you don’t have a rental car or want to go with a tour group, there’s a great Pearl Harbor full-day tour which includes a narrated tour of the USS Arizona Memorial given by a member of the National Parks Service. Head eastward and get out past the skyscrapers and into the open road. Your first stop will be Hanauma Bay, a popular spot for snorkeling and seeing fish and other marine life in a protected volcanic crater. The bay is closed on Tuesdays and entry is $7.50 (12 years+), parking fee is $1. Stop at the Makapu’u Point Lighthouse Trail and take the easy 30-40 minute hike to the top which promises spectacular views of the ocean. Continue on up the Windward Coast, where you stop at Waimanalo Beach, with its soft fine sand beach and grab lunch at a local spot like Ono Steaks and Shrimp Shack. End the day at Kailua, the largest town on the Windward Coast, where you can watch the sun set over Kailua Beach Park, before heading into town to have dinner at Willow Tree Korean Restaurant. For morning fuel stop at Royal Kitchen in Honolulu’s Chinatown for freshly baked manapua (similar to Chinese baos), filled with flavors like kalua pig and black sugar. Afterward, walk around the adjacent Chinatown Cultural Plaza and the Maunakea Marketplace. In the afternoon, head to Iolani Palace in the heart of downtown, where you can learn about the royal residence of the Kingdom of Hawaii rulers before it became a state. There are self-guided audio tours as well as traditional guided tours available. For food, Lucky Belly is a solid choice for dinner, where they serve delicious oxtail dumplings and pork belly bao. For your last day in Oahu, take a road trip up Highway 99, to the northern part of the island. Stop at the Dole Plantation, for a bit of history and their famous dole whip pineapple ice cream. Down the road, visit historic Haleiwa, where you can grab Aoki’s Shave Ice and wander around the town a bit before continuing on to the famed North Shore beaches. Head to Sunset Beach and watch the surfers do their thing, before heading to nearby Ted’s Bakery for garlic shrimp and chocolate haupia cream pie. Most hotels are clustered around Waikiki Beach, and this is a good place to stay if you want to be central, and walking distance to the beach, restaurants and shops. The area is known to be pricey, but you can usually find something within mid-range depending on the season. A boutique hotel that is literally step from the beach and provides a home in Hawaii at a reasonable price. Other nearby sights include the Honolulu Zoo, and numerous restaurants and shops. It’s sleek, modern design and hospitable staff is a welcome sight after a long day of sightseeing. A free continental breakfast is included with your stay. Located in the heart of Waikiki, this property is steps away from the International Marketplace, Waikiki Beach, and the Royal Hawaiian Center. Rooms are spacious and clean, and were recently renovated. The hotel is connected to the Hawaiian Aroma Cafe that specializes in local Kona coffee and Itailan cuisine, and Maui Brewing Co., where you can enjoy a cold brew, and locally sourced bar bites. This oceanfront Westin property that is centrally located right on bustling Kalakaua Avenue, is a great alternative to more modern luxury resorts. The hotel allows guests to experience historical Hawaii with its beautiful Victorian building that has been around for over a century, but with present-day creature comforts. Highlights include the Moana Lani Spa, The Beach Bar with live entertainment, and fresh seafood at Beachhouse At The Moana. Kauai is a lot more remote than other islands like Oahu, and although there are alternative options, renting a car is your best bet. Ease into Garden Isle life with beach hopping on the southern part of the island. Start at the ever-popular Poipu Beach, where you can sunbathe and snorkel to your heart’s content. If you’re lucky you might even see a sea turtle or two. Afterward, head to Old Koloa Town, where you can pick-up a plate lunch at Sueoka Snack Shop, before heading to neighboring Kiahuna Beach, a quieter counterpart to bustling Poipu. For dinner, head into Koloa for memorable Hawaiian BBQ (whatever you do get a side of kimchi rice) at Kiawe Roots. Get up bright and early to explore Kauai’s picturesque northwest coast that has been the star of many films with its dramatic sea cliffs and waterfalls. A great way to see the Na Pali Coast up close and personal is through a daytime boat tour, where you will have time to soak in all the natural beauty at a leisurely pace, and lunch is often included. If you want to treat yourself to an aerial view of the beautiful coastline, a small plane tour would be a good alternative. Road trip your way over to the western side of the island, where it feels like you’ve entered an Old Western movie set and everywhere you go there’s a layer of red dust on everything. Welcome to the Westside. Stop at Hawaiian Style Cafe for some hearty banana macadamia pancakes before continuing on to the major attraction, Waimea Canyon, which is often referred to as the Grand Canyon of the Pacific. Route 550 winds along the canyon, offering several scenic lookouts, and ends in Koke’e State Park. On your way back home stop at the neighboring town of Hanapepe, which hosts the popular Friday Art Night, featuring local artists and plenty of food trucks. For dinner, Japanese Grandma’s Cafe, with some of the freshest sushi on the island hits the spot. Head up to the beautiful North Shore, stopping first at the Kilauea Point National Wildlife Refuge and Lighthouse, where you can see the rugged coastline and many bird species a quick walk from the parking lot. Make a brief stop in Princeville, which is often referred to as Haolewood by locals because of the local lavish lifestyles, and get some Lappert’s Ice Cream in the Princeville Center. The final destination is Hanalei, which is a small town and feels like somewhere in Southeast Asia, with its taro fields and beautiful mountains. Stop by Harvest Market to pick up fresh fruit smoothies and an ahi tuna wrap to fuel the rest of your day. Spend the afternoon at Hanalei Bay, or if you want something a bit more active kayak or SUP down the Hanalei River. For the last day, make your way to Lihue, the cultural and government hub of the island. Drive to Wailua Falls, not too far from the city of Lihue, to beat the crowds. The double waterfalls are right off of the parking lot, and there’s an overlook that provides stunning views. Drive back to Lihue and visit the Kilohana Plantation Estate, where you can go on a plantation farm and orchard tour, or eat at Gaylord’s for a decadent farm-to-table lunch. Kilohana is also known for its impressive luau at night, which features traditional Hawaiian cuisine and entertainment. If you are looking for more casual eats, Fish Express is a great spot to pick up a poke bowl and bring it to Kalapaki Beach. 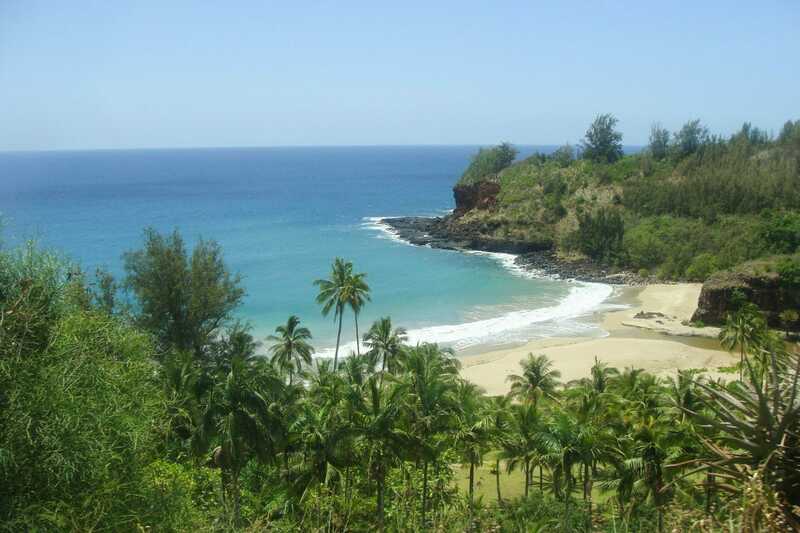 The drier South Shore (Koloa, Poipu, and Lawai), the rainy North Shore (Princeville and Hanalei, and Kilauea), and the East Coast (Kapaa, Wailua, and Lihue), are the popular spots to stay on Kauai, where you’re close to either sandy southern beaches, the rugged coastline of the north or the bustling country seat on the east side. Here’s some mid-range to luxury choices in these three areas. Located in Lihue, these beachfront condos are a great home base for those who want to be halfway between the South and North Shores, while also in the middle of the action in Lihue. With a spacious outdoor pool, full-service spa, and stunning ocean views, it will be tempting to stay on property. Free airport shuttle included. These Princeville condos are ideal for guests who want to have the convenience of their kitchen and washer/dryer unit at their disposal. Condo options come with either one bedroom or two. There’s no shortage of things to do on property, with 2 outdoor pools, 3 hot tubs, and an outdoor tennis court. An expansive, stunning property located in Koloa that includes a luxury spa, panoramic ocean views, and a wide range of pools to cool off in. This central location includes close by destinations like Poipu Beach, and Poipu Shopping Village, which are both a little over a mile away. What would be on your Hawaii itinerary?